FILE - Chinese President Xi Jinping attends a plenary session of China's National People's Congress (NPC) at the Great Hall of the People in Beijing, March 12, 2019. China's President Xi Jinping received his first-ever foreign honorary doctorate, in engineering, Thursday from the University of Johannesburg in South Africa. University officials praised the powerful leader for his contributions to engineering and for what they called his world vision, but critics question the move. 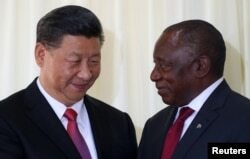 FILE - China's President Xi Jinping talks with South African President Cyril Ramaphosa after their media conference in Pretoria, South Africa, July 24, 2018. 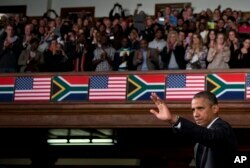 FILE - Then-U.S. President Barack Obama speaks at the University of Cape Town Sunday, Jun. 30, 2013, in Cape Town, South Africa. Africa-China analyst Cobus van Staden, who works at the University of the Witwatersrand, said it’s clear to him who stands to benefit from this honor — and it's not Xi.